Whether you call it mental illness, lunacy, or insanity, being crazy isn’t fun. It’s not a lifestyle choice either. Not for most. Certainly not in my case. I’ll get back to that. Folks started talking about “mental hygiene” after William Sweetser coined the phrase in the mid-1800s. Folks promoting mental hygiene rubbed elbows with social hygiene advocates. I figure many folks had basically good motives for supporting those ideas. I hope so, anyway. But some of their methods were — dubious. Eugenics and sterilization of the unfit developed serious image problems in the 20th century. That’s another topic, for another post. Somewhere along the line “mental hygiene” got repackaged as “mental health.” I think it wasn’t just a new coat of paint on old ideas. We were learning more about how minds work, and sometimes don’t. Crazy people have been part of societies for a very long time. Folks in different eras tried various approaches. Some were better than others, I think. Bedlam started as a priory in 1247. It had a different name and wasn’t a clinic or asylum of any sort. One of its functions was to house the poor. The city of London got involved in managing the priory’s finances in the 1300s. Two centuries later, Henry VIII owned the place. There’s probably quite a story behind the Lord Mayor of London asking for, and getting, control of Bedlam, its occupants and revenues. That deal was finalized in 1547. 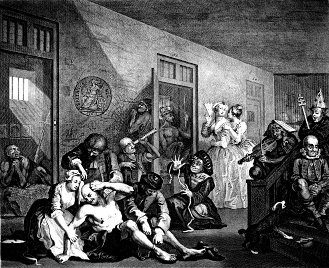 Somewhere between 1377 and the 1700s, Bedlam started specializing in folks with mental problems. Hogarth’s final installment of “A Rake’s Progress” isn’t entirely fanciful. Friends and family could visit inmates — and were expected to bring food and other needed items. I’m not sure why Bedlam’s management let the general public in. I’ve run into speculation that putting inmates on display helped them make money. English sensibilities eventually changed, and using lunatics for public entertainment became unfashionable. As I keep saying, we do learn. Slowly. Meanwhile, in France, the Pitié-Salpêtrière Hospital has a shorter, but similar, story. Louis XIV remodeled a Parisian gunpowder factory in 1656, making a hospice for the city’s poor. Part of the hospice was later used as a prison for prostitutes. The mentally disabled, criminally insane and epileptics got housed there, too. Given what folks knew at the time, and how European society worked, it may have been the best a secular leader could do. The French Revolution wasn’t going smoothly in 1792. There was even talk of Royalists and foreigners invading Paris. Journalist Jean-Paul Marat and others decided something had to be done. So a bunch of French National Guardsmen and some fédérés forcibly removed folks from the old gunpowder factory and similar institutions, and killed them. It made sense at the time, sort of. Marat and company figured the lunatics and other prisoners might support royalists. Killing them removed the perceived threat. These days we call what happened the September Massacres. When we mention it at all. France got Napoleon next, which may have been an improvement. Some folks took another look at how their mentally ill neighbors were treated in the early 19th century. We’ve learned quite a bit since then.2 Including, I hope, a little wisdom. Hippocrates of Kos talked about diseases and other disorders folks deal with around the time Sophocles was writing his plays. Talking about diseases isn’t why Hippocrates is famous — among history buffs, anyway. It’s what he thought about illness. He gets credit for being the first in Western civilization to say diseases have natural causes. The accepted belief then was that folks get sick or crazy because they’d offended some spirit, or run into a grumpy god. Quite a few folks believed pretty much the same thing after Hippocrates wrote his medical texts. Hippocrates was on the right track. Some Christians, Catholics included, act like they put their culture’s pre-Christian beliefs and new ideas into a blender. Make that our culture’s. I strongly suspect that some of American Christianity’s weirder fringes are syncretic religions, and that’s yet again another topic. Maybe that needs explanation. Recognizing natural causes doesn’t require ignoring other realities. But trying to exorcise my depression would be an exercise in futility, at best. Thinking that Satan and demons are real is one thing. Seeing direct Satanic involvement in illnesses is another. The Church authorizes exorcisms, occasionally. It’s a well-established procedure, involving specialists. It’s emphatically not a do-it-yourself job, and that’s still another topic. My depression and assorted psychiatric problems did not start when someone hexed me. I’ve got glitchy neurochemistry to thank for that sort of thing. Also, almost certainly for the depression, triggering events. With a very different history I might have avoided decades of undiagnosed issues. On the other hand, maybe it’s just as well that my depression and autism spectrum disorder(s) weren’t caught early. Lobotomies hadn’t quite gone out of fashion, for starters. Still, it wasn’t all bad news in the mid-20th century. I’m taking medications that didn’t exist until recently. They don’t ‘cure’ my odd neurochemistry. But taking them makes dealing with it easier. I didn’t enjoy learning that I have psychiatric/personality problems. But pretending they weren’t there didn’t make sense, and wouldn’t help. Taking reasonable steps to deal with the issues did. And does. I’ve seen a few op-ed pieces discussing a common factor in recent mass murders. It’s not the technology involved, or who the victims were. Folks who decided to start killing had mental health problems. Some of that may be 20-20 hindsight. But I think strictly sane people don’t wake up one morning and start the day by murdering folks in a church or school. Not generally. Mass murder is hardly a new phenomenon. Separating fact, folklore, and rumor isn’t easy. Particularly for the days before Elizabeth Báthory. More about her later. Quite a few Roman citizens died in 331 BC: apparently from disease. Maybe they did. That’s what Livy hoped was the case. But he knew enough about his culture to record an another account of what happened. The apparently-unofficial story was that a servant with access to poison killed the citizens. I’m not convinced that the servant was a mass murderer in today’s sense. In that era and culture, her actions seem more like an assassin’s. Locusta’s career ended when her last patron, Nero, committed suicide. Elizabeth Báthory killed several hundred young women before Hungarian authorities took notice. I suspect too many folks started talking about a shortage of peasant’s daughters in her area. We’ve got pretty good documentation of her trial, thanks to her wealth and social position. That’s helped sort out reality and slightly more lurid details that got added later. She was convicted, imprisoned, and died in 1614. After killing his mother, a young man killed 20 children and six adults at Sandy Hook Elementary School. Then he killed himself. I saw many opinions, and a few facts, in the news over the next few months. Some folks focused on the weapon used. Others on video games he’d played. He’d been home schooled, which prompted predictable responses. That’s a can of worms I’ll open another day. I don’t feel sorry for him: even though we both have autism spectrum disorder in our medical records. I don’t think that excuses bad behavior. But understanding what he was dealing with may help us understand what happened. I’m a mess. Far from “normal,” at any rate. I spent my adolescence and decades of my adult life dealing with major depression. I still do. But very strong antidepressants let me think without fighting the machinery. It’s a wonderful change of pace. My other neural quirks — plural — quite likely started as soon as I had a central nervous system. Two of my kids have very similar abilities and limitations. So did my father. I very strongly suspect that whatever it is, it’s genetic. At least in part. I’m not entirely convinced that my non-depression glitches are autism spectrum disorder. But that’s the closest anyone’s come to finding a name for whatever it is. It gives me and professionals something to work with, so I’m content. We’ve learned a great deal since my birth. Infants and children who respond as I did are caught early. On the whole, I think that’s a good thing. I also think we’re still learning. And have a very great deal left to learn. Getting back to antisocial behavior, I don’t think I’m a time bomb about to go off. For one thing, I started cooperating with treatment immediately after being diagnosed. That was over 11 years ago. This entry was posted in being Catholic and tagged health, history, medicine, mental health. Bookmark the permalink. Thank you for this fine article Brian. I empathize, and I agree, knowing my own situation, that of parents, siblings, children and grandchildren, that there’s a genetic link to depression, Ausberger’s Syndrome and related disorders. There may be compensating factors to these also; one grandson who we think has a mild case of Ausberger’s was doing three digit calculations in his head at the age of three and reading… so… ??? I also agree that neurochemicals, properly applied, are a saving grace, as is prayer. And perhaps the latter is more important. Prayer? Most certainly. I’m about nine months into a new prayer routine. ( http://brendans-island.com/catholic-citizen/new-daily-prayer-routine/ ) That’s something I should revisit in one of these posts. I’m glad you thought well of this article. And thank you for adding your thoughts.